The Kansas quartet's third full-length release is its crossover album. From the bitter regret of 'Rewind' to the anthemic 'Frontline', Pillar's songwriting is straightforward in both execution and intent. 'Dirty Little Secret' explores the shame of addiction, while boasting irresistible riffing courtesy of guitarist Noah Henson. 'One Thing' captures the commonality of human experience, a spiritual touchstone for a band that rests its foundation on meaningful, positive expression. 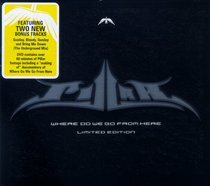 About "Where Do We Go From Here Limited Edition"
:The Kansas quartet's third full-length release is its crossover album. From the bitter regret of 'Rewind' to the anthemic 'Frontline', Pillar's songwriting is straightforward in both execution and intent. 'Dirty Little Secret' explores the shame of addiction, while boasting irresistible riffing courtesy of guitarist Noah Henson. 'One Thing' captures the commonality of human experience, a spiritual touchstone for a band that rests its foundation on meaningful, positive expression.